Collection systems topics are no stranger to the list of top 10 attended sessions for all of WEFTEC. Perennially, “Collection System Basics,” — this year Session 313 — makes this list. And the field operations session — this year Session 512, “A Fresh Perspective on Front Line Operations” — made the top 10 ranking at WEFTEC© 2014. Both of these sessions target newer members of the collection systems community, those who will be experts of the future. Photo courtesy of David A. Hofer. 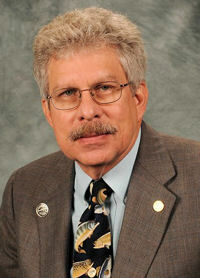 Dave Hofer is senior technical and quality engineer at Johnson, Mirmiran & Thompson (Sparks, Md.) and chair of the Collection Systems Symposia Subcommittee. The Collection Systems Symposia Subcommittee consists of 16 members who are selected based on job category such as utility, consultant, regulator, manufacturer, and academic; geographic area; and special expertise or qualification. Members are expected to serve a minimum 3-year term. The Collection System Symposia subcommittee of the Water Environment Federation (WEF; Alexandria, Va.) Program Committee, is actively supported by the Collections System Committee. Every year the 16-member subcommittee is charged with reviewing abstracts submitted for possible presentation at WEFTEC. Members of the symposia subcommittee look for presentations that focus on important concepts and methodologies that took today’s experts years or even decades to learn, develop, or discover. Sometimes it might be “an oldie but goody,” but other times it might be a recent discovery or improvement. In all cases, the abstracts chosen contain what is considered essential knowledge for new operators, technical staff, and managers. By starting with basic information, instead of having to reinvent the wheel, who knows what advancements the next generation of experts will be able to make? Typically in early December, symposia subcommittee leadership, which includes a chair, vice-chair, incoming vice-chair, and past chair, prescreen 200 to 300 abstracts to eliminate any that applied to the wrong symposia subcommittee (it happens more than you would think) or that failed to meet basic minimum standards. About 150 abstracts that make the cut then are sent to all the symposia subcommittee members who complete a full review using a standardized scoring system. The scores are compiled, and the group meets at the annual WEF midyear meeting in early February to discuss the top 50% or so of the abstracts. From that group, about 8 or 9 technical sessions are developed for presentation at that year’s WEFTEC. If any gaps in a certain topic area are identified, they are filled with either an invited session or, more often, with an invited paper. In addition to sessions, Collection Systems will be featured in the exhibition. The Sewer History Exhibit, developed by Jon Schladweiler, a retired collections system operator in Arizona, is many attendees’ favorite exhibit. Schladweiler and some of his exhibits have even been featured on national television shows. This year, he has been lured away from his exhibit and is presenting half session talk, “Tracking Down the Roots of Our Sanitary Sewers.” He will speak the morning of Sept. 28 about the 5000-year history of sewers. This is a unique opportunity to learn how the water sector got started and arrived at where it is today. And maybe you can identify that oddball piece of pipe you found in one of your old neighborhoods and find out why it is there.